Because the TSA won't allow any liquid over 3 ounces in a carry-on, countless trips to Northern California and Paris have been marred by the following Sophie's Choice: do I buy wine and risk what it might do to the insides of my suitcase at high altitude, or leave behind the perfect, previously un-findable bottle. The Wine Skin is not technically a gadgetunless you consider a bag a gadgetbut it is the most useful bag any plonk-mad traveler can have. 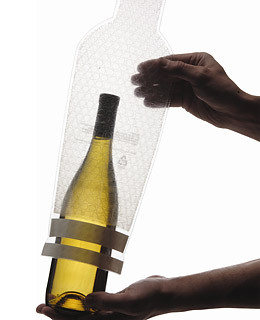 You take your bottle, insert it in the bottle-shaped bubble wrap bag and seal it up air-tight. The bubbles prevent it from breaking in-flight, but if you hit turbulence, the seal prevents any liquid from leaking out and ruining your clothes. So, yeah, it's basically a wine condomwhich might not sound particularly attractive, but it's a lot prettier than a suit dunked in Chateau Margaux.